Quickly we became involved in even more devices for which we saw the possibility to deliver replacement batteries. Consequently, batteries have been sold for: mobile phones, digital photo & video cameras and gps devices. Eventually, since 2006 BatteryUpgrade.com has been a fact. 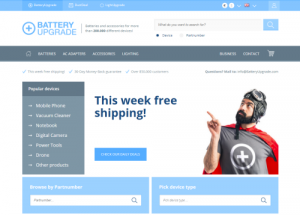 Nowadays we offer 35 different categories for which we supply in replacement batteries. Addtionally, we have also been selling other products for devices besides batteries, like: chargers, memory cards, rechargeable/disposable batteries, cases, powerbanks and cables. 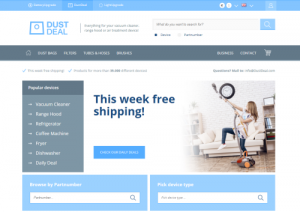 In 2013, DustDeal.com has been established. On this website we offer replacement products for the vacuum cleaner. These are products like dust bags, tubes, hoses and brushes. Additionally we offer a large assortment in filters for e.g. the range hood, refrigerator, fryer and the dishwasher. 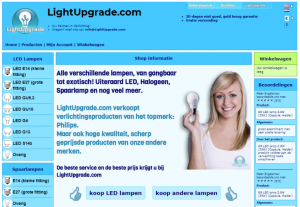 In 2014 LightUpgrade.com has been set up. On this website we offer various lamps, like LED lamps, CFL lamps, Halogen Lamps and Incandescent Lamps. With all our websites we are active worldwide. They are translated in 23 languages!